Enable is the UK’s leading disability and lifestyle title – we’re even award nominated. Each issue is bursting with the latest news, real lief stories, advice, plus the best celebrity interviews. Promoting a strong message – forget can’t, think can – the magazine has received an incredible response from readers and advertisers alike due to its fresh take on all things disability. 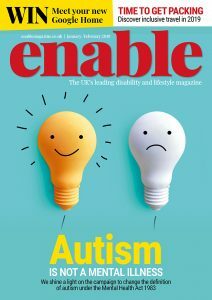 Since its launch in May 2011, Enable has featured big-name interviews with the likes of TV star Katie Piper, rugby legend Doddie Weir, Parlympian Jonnie Peacock, and many more; we’ve spoken to the most seriously-injured survivor of the July 7 London bombings, offered a wealth of employment advice, kept readers up-to-date on the latest news and events and helped to clarify legal speak, politics and changes to legislation. The future is bright for Enable and our readers.